The Wicklow red kite project was boosted today after a two year old injured red kite "Blue Blue =" was nursed back to health by Gillian Hicks and the team at Cloverhill Veterinary Clinic, Glenealy, Co. Wicklow. The bird was found last week by a member of the public, Robert McCoy who brought the bird to the vets for care and then the project team kept the bird for a few days in the aviaries, gave it plenty of food and released in back to the wild. Robert informed the project team "he just loved seeing the kites in the area and was glad the bird was back in the wild". The team at Cloverhill affectionately named the kite "Damian", after the British Trust for Ornithology (BTO) ring around its leg, used to identify the bird, which ended in number "666"! This was a very appropriate name as previous red kite project manager, Damian Clarke, released the kite back in 2010. The bird was raring to go and was met by another two other kites as it circled the fields it was released from near Redcross. The kites are currently gathering into communal winter roost sites and at this time of year birds can be seen in groups of five or six. Up to 27 red kites have been recorded during the winter circling Avoca village. The project is very grateful to Robert and the team at Cloverhill for their care of the kite and support for the project. An Irish Red Kite, hatched and fledged from a nest in Wicklow, has for the first time nested, bred and reared its own young near Redcross. As part of the national bird of prey reintroduction programmes in Ireland, Red Kites, Golden Eagles and White-tailed Eagles have all bred in Ireland in recent years. But all these breeding adults have hatched in their respective donor stock countries (Wales, Scotland and Norway) and were subsequently collected and reared in Ireland. This summer the breakthrough came when an Irish bred Red Kite, hatched and fledged from a nest in Wicklow in 2010, has bred itself and reared its own young. This is a major milestone in the gradual restoration of kites and eagles to their traditional haunts in Ireland. This breeding kite was one of the first wild-bred Irish kites, "Blue Blue 7", hatched just outside Avoca village in 2010 and was recorded breeding at this year's nest which had a web-camera fitted. This camera allowed the public to track the fortunes of two kite chicks until they fledged. "Blue Blue 7" was a male and it bred with a female "Blue Purple T" released from the first year of the project in 2007. The Minister for Arts, Heritage and the Gaeltacht, Jimmy Deenihan T.D. welcomed the news of the successful breeding this year. He said "I have been following the progress of this project with keen interest since I took office and I am delighted that we now have a second generation of kites in Ireland. I congratulate the project team on this success and am particularly grateful to farmers and landowners in Wicklow for the way in which they have helped to look after these birds." The project is part of an All-Ireland effort to restore red kites. There were 120 Red Kites released in County Wicklow between 2007 and 2011 and subsequently 80 Red Kites were released in County Down between 2008 and 2010 and 40 kites were released in Fingal, County Dublin in 2011. The Irish Red Kite Reintroduction Program is managed by the Golden Eagle Trust in partnership with the National Parks & Wildlife Service (NPWS), of the Department of Arts Heritage and the Gaeltacht, and the Welsh Kite Trust. The Wicklow project has been funded by NPWS, the Heritage Council and Greenstar Ireland and supported by Coillte Teoranta. The Royal Society for the Protection of Birds (RSPB) released the birds in Northern Ireland. The level of local support and interest in red kites among local people in Wicklow has been exceptional from the start. Over a hundred people attended an open day on red kites in the Woodenbridge Hotel in April this year and the newly formed Aughrim Rugby Club has adopted the red kite as their club logo. People simply enjoy watching the graceful flight and antics of soaring kites and areas such as Avoca, Rathdrum and Redcross are now attracting visitors in search of the kites. Red Kites are quickly becoming another symbolic attraction of the wooded Wicklow landscape. In the distant past, our ancestors closely observed Red Kites across the country. One almost forgotten Irish name for the Red Kite was Preachán Ceirteach - meaning the Cloth Kite [or Cloth Scavenger]. This close association between kites and people was reinforced this year when a nest near Rathdrum was lined with six soft DIY gloves, four socks and part of a pair of water-proof trousers! Obviously Irish kites are still lining their nests with old rags and rubbish. Overall, this breeding season, the project team located 24 pairs of kites in Wicklow, which were defending territories or showing signs of breeding activity. Seventeen of these pairs are confirmed to have laid eggs. Subsequently six nests are known to have failed in the horrendous wind and rain this summer. Three nests were blown completely from the trees. Eleven successful nests are known to have produced 23 young kites. This includes three broods of three chicks, which is an indication of the suitability of the kite territories. In total, 52 wild bred chicks have been produced in Wicklow between 2010 and 2012. The number of wild Wicklow bred chicks reared annually is now matching the number of Welsh young released initially and the Golden Eagle Trust is confident that the Red Kites can regain their traditional place in the Wicklow landscape. The ringing and tagging of kite chicks was undertaken in June with red wing-tags fitted on the right wing, being used as the 2012 colour code - allowing observers to identify individuals and age the kites. Seven territories were located in Coillte forests. We look forward to developing our existing co-operation with Coillte management and exploring ways of enhancing the management and public viewing of kites in Wicklow. But the majority of kite nests were found on farms and private residences and once again we sincerely acknowledge the vital support of scores of kite watchers in County Wicklow. The key role of farming in increasing Ireland's wildlife is vital and Red Kite Project Manager, Dr Marc Ruddock, said; "The level of co-operation and support from the local community and farmers has been phenomenal and I personally really enjoy meeting the landowners each year that are all so genuinely so proud to have kites nesting on their land. I also want to thank all the volunteers who helped find the kite nests and during tagging." As a volunteer looking for some work experience, I really wasn?t sure what to expect when I arrived in Wicklow, or what the next week might hold in store for me in terms of sightings, work and of course the weather. However, after a night in the Woodenbridge Hotel, Marc Ruddock and I quickly established how my time would play out and (once I?d got to grips with the observation form) I quickly found myself hidden in a gorse bush, binoculars and scope in hand, staring out at a patch of trees some 500m or so away. The way these situations unfold is as such: Marc has several years? worth of nesting, survival and pairing information locked up in his head; he uses this to try and work out where certain pairs may be nesting (a difficult problem when you consider that Wicklow is the most forested county in Ireland) and which kites are nesting with whom. This memory-based information is then supplemented by reports from local farmers and people interested in the kites, who may call in to say that a pair has been spotted circling above a certain patch of trees or a certain area. At this point an observer will go and survey the area and keep their eyes peeled for any sightings of kites, all noted down along with time and location, and will watch their behaviours for any evidence of territorial displays or nest building behaviour. In a perfect world this observer will also note the birds? wing tags, but kites are anything but helpful in this regard, and trying to read tags from a kite on the wing is next to impossible without a camera. While sat in my gorse bush the beauty of the area slowly sinks in. I come from a little village nestled in the Cotswolds, an area of famously rolling fields and beautiful views in the centre of southern England. However, I find the mountainous nature of Co. Wicklow is amazing, a kind of more rugged version of my Cotswolds. While mulling all this over in my bush a fox pops his head out from not three metres along and turns to face me. We?re then locked in an agonizingly slow battle to see if I can get to my camera before my movement becomes too much: I lose and he annoyingly bolts. When the kites did come in they come in quick and sharp to their tree. These birds that can spend hours lazily soaring without so much as a wing beat have a surprising turn of speed in landing and are very difficult to track using the telescope Marc has kindly lent to me. All I got from my position is a movement in your periphery and then about six seconds of flight before it disappears, lost in the branches somewhere. However, I am happy, my first recorded kite sighting! Nothing more occurs in the air for a further twenty minutes until I happen to glance down the ?scope aimed at their tree and catch a bird sitting in perfect view, perched up on a branch. It?s a gorgeous bird, (light) blue / pink Q as its wing tags name it and a local as the light blue left wing tag records. Its mate (blue / blue t) joins it in a few minutes and the pair sit and eat together, and spend about fifteen minutes just enjoying each other's company it seems, before taking flight again and I lose them in the bushes. This program of me taking up a viewing point and watching a stand of trees or area becomes the routine for the next four days, with varying success in our hunt for kites. During this time I endured some kite droughts, when an area had to be ruled off as a nest site based on the apparent absence of any activity. But, I also enjoyed the greatest views I?ve ever seen of the majestic birds, such as on my final day when blue / purple F spent the best part of an hour posing for us and our telescopes, and the close-ups that Avoca?s inner-village bird brown / black V provided us on its lazy circles just overhead. I hugely enjoyed myself and am ever thankful to Ronan Hannigan and Lorcan O?Toole who arranged my visit, and to Marc Ruddock for putting up with five days of inane questions about the habits of kites. The autumn and winter has required a lot of fieldwork and also a large amount of data entry, reports and funding claims to compile ? unfortunately it's not all about watching kites and sometimes we have to do some 'real' work! We are extremely grateful to our all project funders and the support from the public and volunteers. Since the winter and the disappointing loss of nine kites in Dublin during November and December to rodenticide poisoning the monitoring of the red kite populations has continued each week in both Wicklow and Dublin. The dead kites located in Co. Dublin were identified by their blue left wing and white right wing tags and were found as follows C8 (2nd Nov) A5 (5th Nov), @ (17th Nov), £ (17th Nov) ? (21st Nov), ? (2nd Dec) B0 (9th Dec) and A3 (18th Dec). Since the last bird was found, to date - touch wood - no other dead kites have been found. Roost watches have been undertaken weekly throughout the winter by the monitoring team and volunteers with kites roosting primarily at three locations near Lusk, Swords and Skerries in Co. Dublin and several large roosts in Avoca and Redcross in Co. Wicklow. In Avoca during January a peak counts of 27 kites were recorded circling at pre-roost time over Avoca village and this was absolutely stunning to watch! As recorded previously in the project updates the radio-tracking routinely identifies 10 of the 13 released kites in Wicklow. Visually from wing-tag sightings 12 of the 13 are confirmed to have survived their first winter. Hopefully 'lucky' number thirteen from Wicklow (Blue / White Z) is somewhere out there too as its radio is no longer functioning. In Dublin 12-15 red kites are routinely detected east of the M1 motorway as far north as Balbriggan and Skerries and usually no further south than Malahide although most birds are usually found in the Donabate, Rogerstown or Lusk area. A small satellite group of three to six birds are often located west of Swords. There is some evidence of birds moving between areas and birds are foraging regularly over five kilometres from the roosting areas. Some kites are regularly seen crossing the M1 foraging so it is definitely worth keeping an eye out when passing through North Dublin. Two Dublin red kites have gone south to Co. Wicklow (Blue / White A4 & Blue / White B5) and two have gone north to Northern Ireland (Blue / White B1 & Blue / White B7). One kite spent time out in Mullingar (Blue / White A0) and has come back into the Dublin area and one Dublin kite (Blue / White A2) has recently been spotted in Wexford! The spring monitoring of nesting behaviours is continuing in Wicklow and we are keeping a close eye out for any potential breeding behaviour or nest building in Dublin although the birds are still a bit young to breed, but fingers crossed?The work during the spring is mainly trying to see where the kites are building their nests so we can monitor the population and also we have to check which adults are breeding by reading the wing-tags through telescopes and cameras so we can see which ones have survived, their age, where they are breeding and establish their breeding success and productivity. The spring has also seen some exciting events and I was lucky to be invited to a celebration of Irish Raptors in March for launch of the recent publication of the amazing book ?Raptors ? A Pocket Guide to Birds of Prey and Owls? which has been written and illustrated by 11-year old Declan Cairney from County Galway at an open day at the Burren Bird of Prey Centre, Ballyvaughan, Co. Clare. On the day there were two talks on Irish raptors, conservation and the work of the Golden Eagle Trust by Lorcan O'Toole and myself (Marc Ruddock). Lorcan shared his enthusiasm and passion for Irish Wildlife and habitats and the work of the trust and conveyed his support and thanks to Declan. I shared my experiences of the red kite project and thanked all the volunteers and funders for the donations received towards the red kite project. The centre raised over ?4000 towards the Dublin red kite project and some of the staff and volunteers helped with the collection, care and release of the kites. Declan had copies of his books for sale and gave a heartfelt talk on his experiences and joy of working with raptors and his book; and presented Lorcan with a cheque for ?500 towards the Golden Eagle Trust projects. This was a humbling day for everyone and I certainly was buoyed by the clear interest, generosity and talents of Declan - the artist and raptor enthusiast. In early April, Declan and his mum Maeve were able to join me in Wicklow for an afternoon of kite watching and we saw numerous red kites, peregrines and buzzards and got some great photographs of a Northern Ireland kite in Avoca (Brown / Black v). The red kite is now a familiar sight around Wicklow farms and villages. Particularly in Avoca village throughout the year and also where notably large communal roosts occur in the winter. People from near and far have come to see the kites and many are captivated by the sight of the graceful, forked-tailed kite floating and gliding over fields, villages and woods in Wicklow. The Golden Eagle Trust in partnership with the National Parks & Wildlife Service and Welsh Kite Trust supported by Coillte Teoranta, the Heritage Council and Greenstar Ireland released a total of 120 red kites in Wicklow between 2007 and 2011 in Co. Wicklow. The final release of 13 Welsh kites took place during 2011. Simultaneously, in 2011 39 red kites were released in Fingal, Co. Dublin supported additionally by Fingal LEADER Partnership, Fingal County Council, Fingal Conservation Volunteers, Birdwatch Ireland, Burren Bird of Prey Centre, AOL Monster Help Day and the Irish Raptor Study Group. 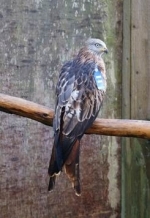 Each red kite was fitted with a radio-tag allowing the project team to monitor the birds since release. Each red kite is also identified by wing tags with a unique code and three kites in Wicklow Blue/White E, Blue/White v and Blue/White Z were initially considered missing. All 10 other red kites were regularly radio-tracked each week throughout the winter. Frustratingly Blue/White E had dropped the radio close to the release cages and had not been seen since September 2011 and whilst the radios had apparently stopped working on Blue/White v and Blue/White Z and neither had been seen since October 2011. After initial fears that these three birds were missing, both Blue/White E and Blue/White v have now both been confirmed alive through photographs taken during the past two weeks. Only Blue/White Z remains unaccounted for, although the radio malfunctioned shortly after release and the bird may still be alive. Amazingly, this represent over 90% survival through the winter of these young released birds. Whilst three other kites were confirmed poisoned illegally last year by alphachloralose, including one of the breeding adult females, the Wicklow kites have also been breeding successfully since 2010 and have produced 12 young in 2010 and 17 young in 2011. With the additional strategic release of 39 Red Kites in Co. Dublin last year and a minimum of 29 young produced from wild Wicklow nests over the past two years, it is hoped the east coast population of kites is secure and will allow the species to spread across the island of Ireland. As part of the celebration this year of the red kites return in Ireland the Golden Eagle Trust are hosting a talk at the Woodenbridge Hotel, Co. Wicklow on 14th April 2012 starting at 1030am. The Golden Eagle Trust project team provide an insight into the project over the past five years and the highs and lows of bringing the red kite home to Ireland. The event has been kindly sponsored by Wicklow County Council; Deirdre Burns, Heritage Officer with Wicklow Council stated ?The reintroduction of Red Kites to Wicklow is a significant milestone for biodiversity in Ireland. Now that the population has been established, the continued success of the project will rely on the interest and enthusiasm of the local community. This event is an ideal opportunity to find out more about these wonderful birds and how local people can play an active role in ensuring that they remain a common sight in the Wicklow landscape?